● "...Since invention of Sweepstakes List I've received over $100,000 in cash and prizes, including convertible sport car and luxury SUV..."
● Sweepstakes List 1.06 is available ! Latest version includes useful features and enhancements. 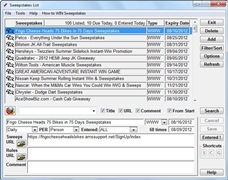 Read more about new version of Sweepstakes List here. ● Download Sweepstakes List here.